Roboception offers innovative navigation, real-time perception and manipulation solutions for robotic systems, thanks to a combination of hardware/software products. Our rc_visard sensor provides ego-motion, depth data and point clouds in real time. Thanks to fusion of inertial and stereo odometry, a robust pose estimation is possible at all times. Visard4ROS will provide a ROS interface to fully exploit the capabilities of rc_visard and to easily integrate it into robotic products or research platforms. 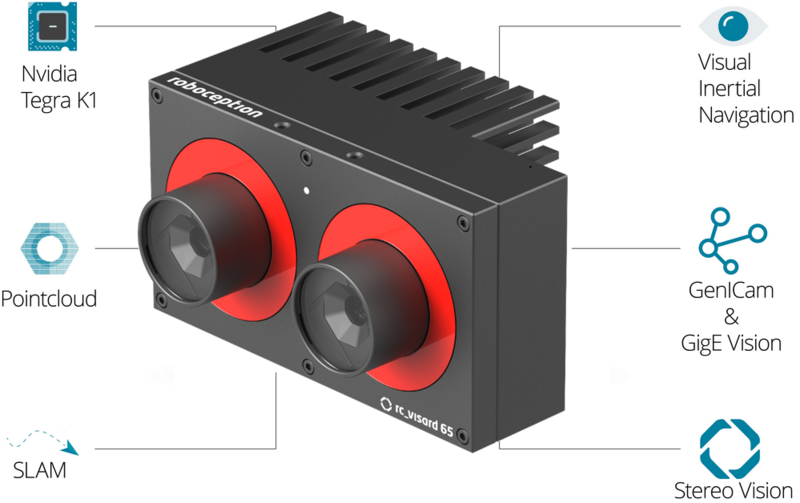 As part of the process, Visard4ROS will also provide documentation for integration of sensors with standard industrial interfaces such as GigE Vision and GenICam, plus examples and good practices for using separate libraries to build ROS-I hardware drivers. Vision in robotics is a challenging problem; current solutions do not even provide the visual capabilities of a two year old child. Still, very strong expertise is required to setup vision solutions, so non-experts cannot really perform this task. Furthermore, environment must be adapted in order to achieve robust and reliable operation of vision systems. This requires individual engineering that results in high cost and restricted versatility. Lastly, camera solutions and lasers usually come at high price for the sensor only, which in combination with the engineering cost makes automation not feasible, especially for small and medium companies that process relatively small batches of products. Roboception GmbH was founded to tackle these challenges and make robot vision applicable to a wide range of existing and novel applications. Our innovative and high-performance 3D sensor rc_visard and accompanying software provides the data needed to close the perception-action loop. Precise ego-motion data is generated reliably thanks to the fusion of inertial and visual odometry, allowing the rc_visard to determine its position and orientation with millimetric precision and very low latency, even when vibrations are present. Roboception’s sensor also provides a confidence value for the depth estimation. This value enables decision making in robotic systems, as it shows how much the sensor reading can be trusted. Additional functionalities such as object recognition, tag detection or SLAM can easily be integrated into the existing software framework. All major processing steps are performed on the on-board processing unit, which facilitates the integration of the rc_visard into any robotic application, with no need for additional hardware. The sensor is IP54 certified, therefore it is well suited for applications in industrial automation and direct integration into the real-time control loop in tasks such as robot navigation and mobile manipulation. The passive stereo sensor works both in natural and artificial light. Last, but not least, multiple sensors can easily operate without interference in the same work space. The rc_visard offers a web-based intuitive interface for easy set-up and configuration, especially oriented for non-expert users. Additionally, the product has a standard GigE Vision and GenICam interface, which allows easy integration into all existing image processing solutions. The objective of Visard4ROS is to provide a ROS interface for robot developers and expert users to fully exploit the capabilities of the rc_visard sensor and integrate it into their prototypes or research platforms.